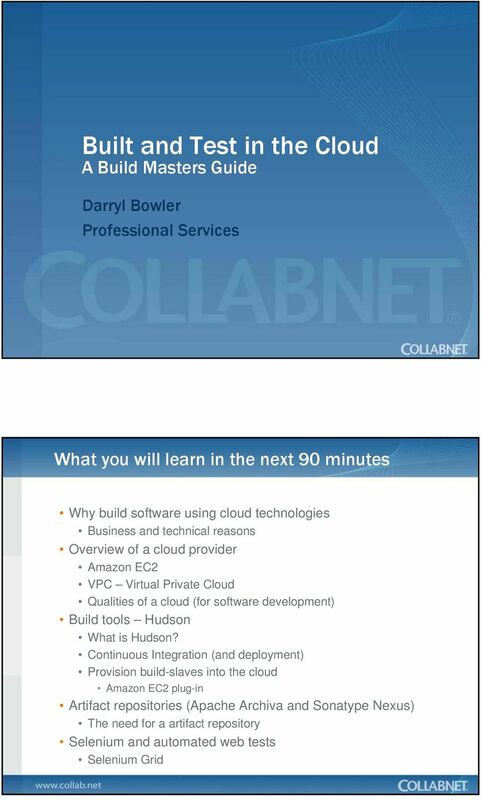 Download ""Build and Test in the Cloud ""
2 Darryl Bowler CollabNet With more than fifteen years of IT experience, Darryl Bowler leads the consulting services business for CollabNet Lab Management, delivering high-value virtualization and test lab automation consulting services to major enterprises. 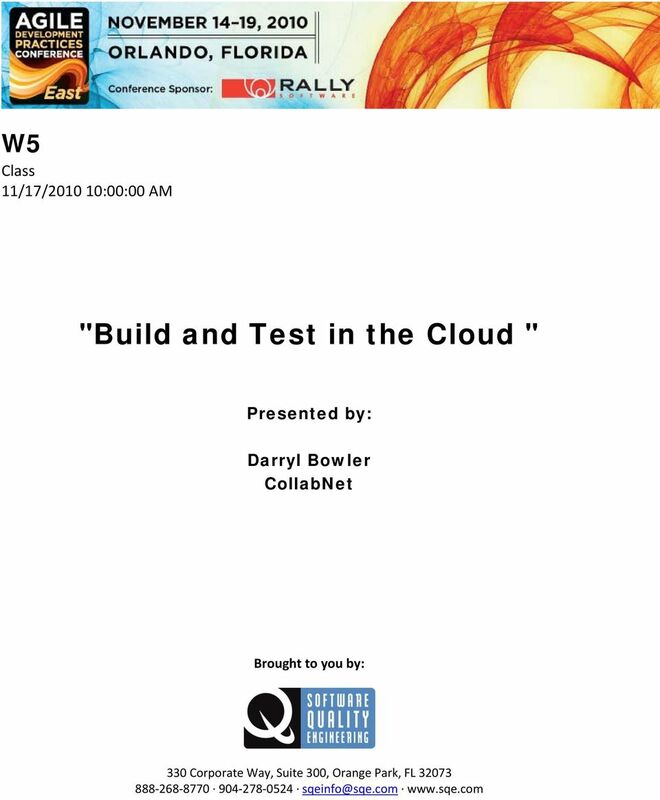 Darryl is an accomplished senior systems architect, specializing in software development methodologies, virtualization, and cloud computing, combined with application lifecycle management and agile best practices. His portfolio of customers includes major financial institutions, a major automotive company, and health organizations. 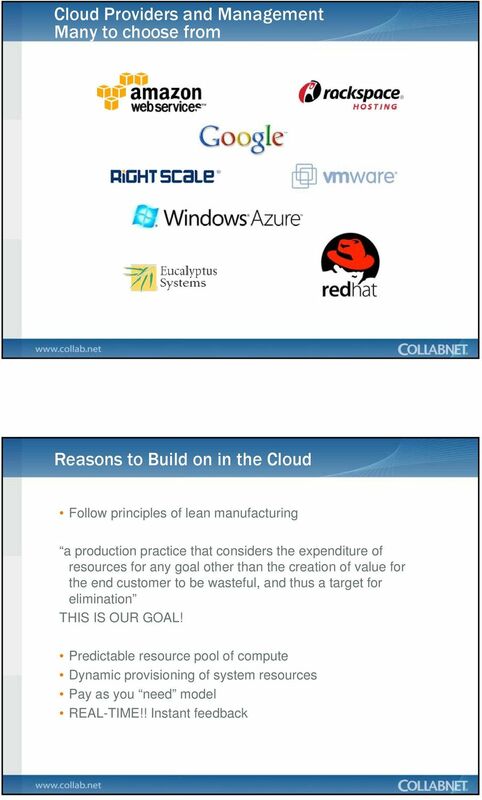 Darryl is currently leading a project to transform the software development lifecycle of a Fortune 50 company. 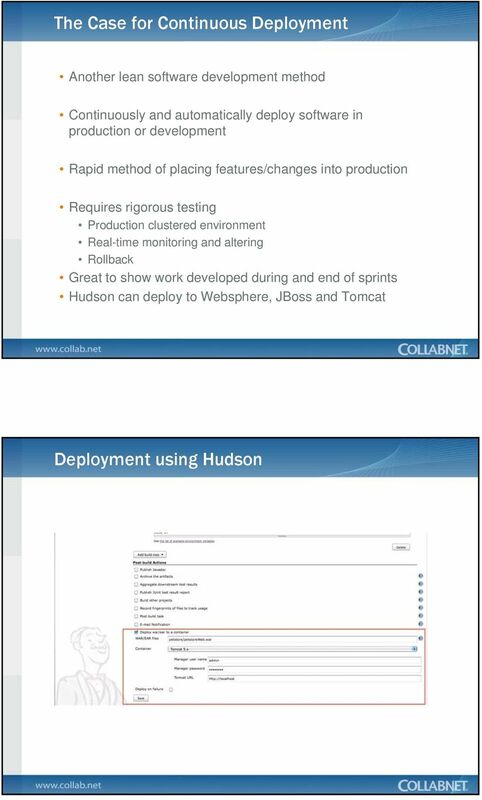 8 Hudson Extensible continuous integration server Java build tool java -jar hudson.war or servlet container such as Tomcat Can run on many platforms Fully configurable from GUI, unlike CruiseControl Monitoring executions of externally-run jobs Other extensive features Change set support, RSS/ /IM Integration, Distributed builds, File fingerprinting and Plug-in Support Hudson support tools/processes that your team uses!! 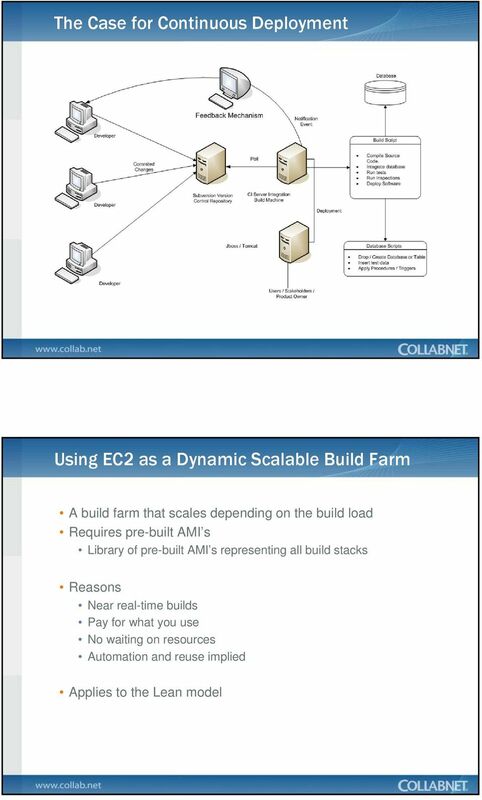 DISTRIBUTED and SCALABE! 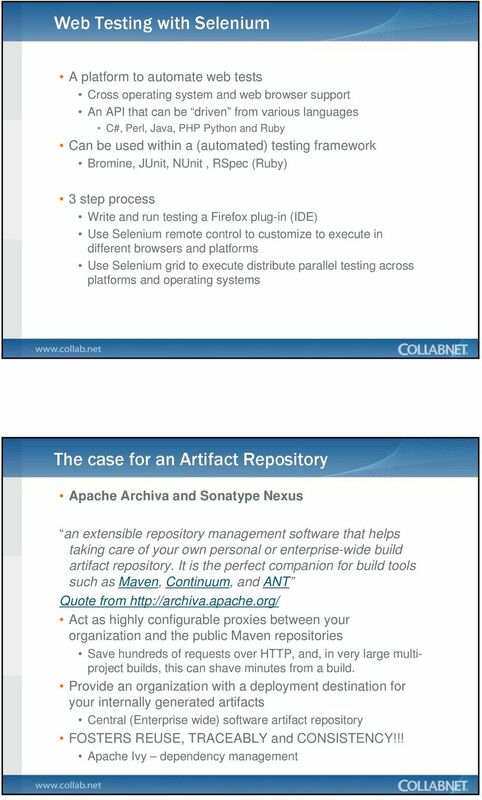 Master / Slave FEATURES OF CI A connection to a version control repository A build script Feedback mechanism SMS A process for integrating the source code Automated inspection and testing 2 Copyright 2008 CollabNet, Inc. All Rights Reserved. 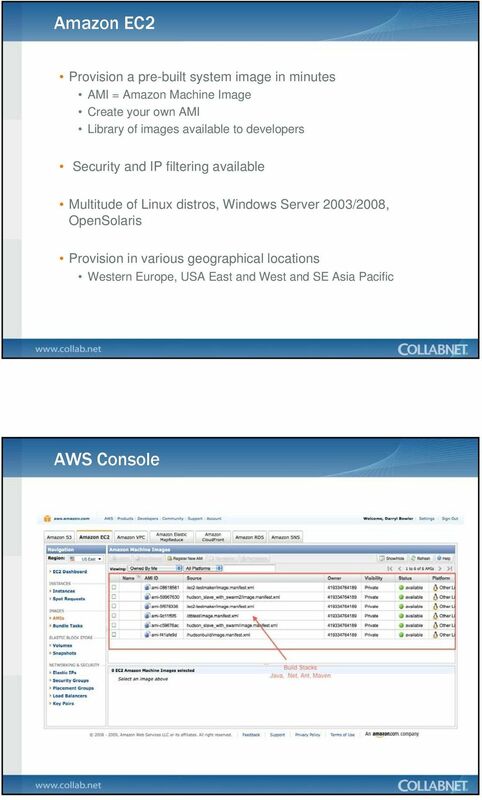 CollabNet Confidential. 9 THE VALUE OF CI Reduced Risk Defects detected and fixed sooner Reduce repetitive manual processes Automated integration, build, inspection and test Allows for more productive and creative work Generate deployable software at any time Health of software is measurable Enable better project visibility More effective decisions (Quality metrics) Establish greater confidence in the software product 3 Copyright 2008 CollabNet, Inc. All Rights Reserved. 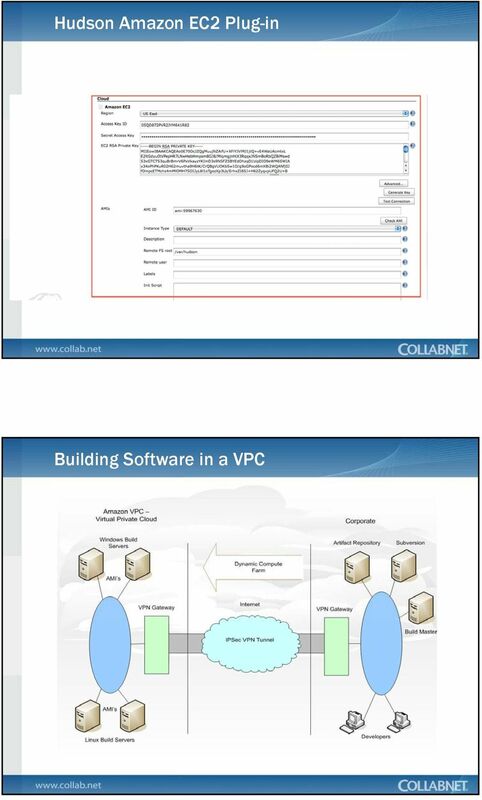 CollabNet Confidential. 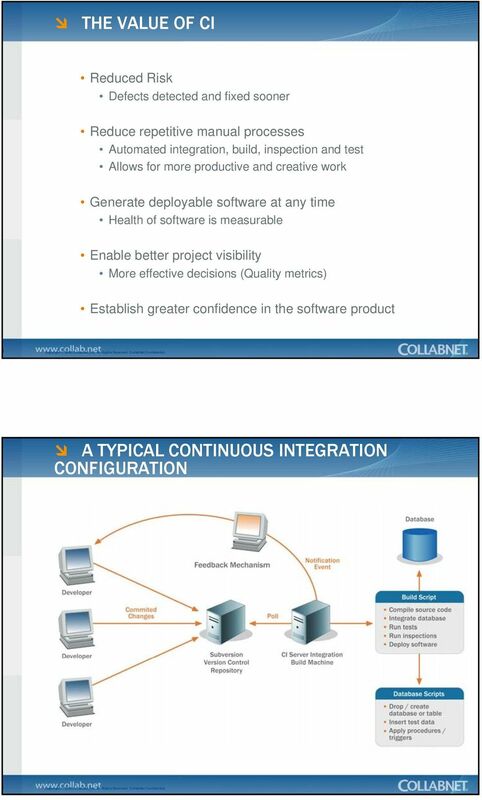 A TYPICAL CONTINUOUS INTEGRATION CONFIGURATION 4 Copyright 2008 CollabNet, Inc. All Rights Reserved. 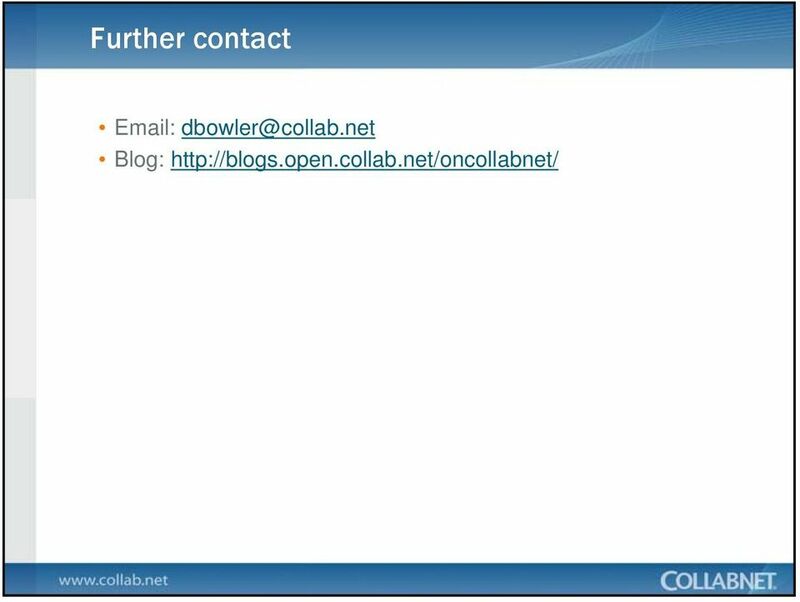 CollabNet Confidential. 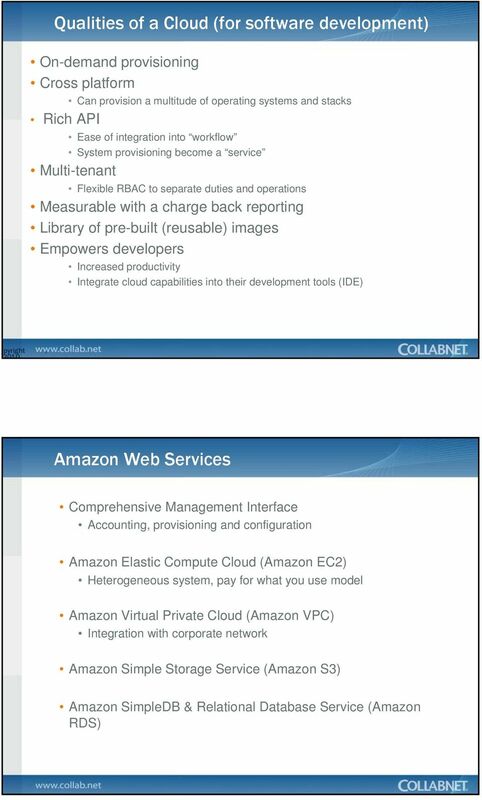 WE RUN SEVERAL ON AWS BECAUSE WE CRITICAL APPLICATIONS CAN SCALE AND USE THE INFRASTRUCTURE EFFICIENTLY.